To create an action line you must enter Move, Scale or Rotate. You can press “W, E or R” on the shelf. 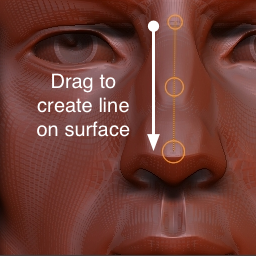 Then click on your model’s surface and drag out the action line. The endpoints of the line will snap to whatever is under them. Any previous action line will be removed. Drag the outer yellow ring of an endpoint to position that end of the line. The endpoint will move in the plane of the screen. The yellow circles will resize to indicate distance from the viewer. To move an entire action line, click on the yellow rim of the center circle and drag it. The line is moved in the plane of the screen. Its distance from the viewer does not change. You can also drag the line itself to move it. To move an end of the action line, click on the yellow rim of an endpoint and drag it. The endpoint is moved in the plane of the screen. Its distance from the viewer does not change. To move an endpoint of the action line to a precise place in a model (for example, to be precisely at a joint), view the model along one global axis (Shift-rotate the model so it ‘clicks’ into a perpendicular view) and center the endpoint properly in that view, then do the same thing while viewing along another global axis. The action line can be moved while creating it by holding the spacebar. Release it to continue drawing the action line. While in Move or Scale (not Rotate) you can hold the Alt key before clicking on your 3D object. This will execute the operation directly without drawing the action line. 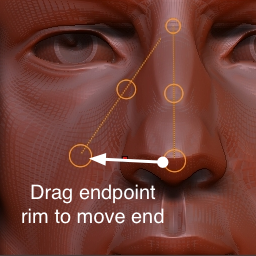 When drawing the action line, tap the CTRL/Command key once to launch the Move, Scale or Rotate operation. When using Rotate or Scale, the center of the operation (scale center or rotation pivot) will be located on the part of the action line that is opposite from your cursor. 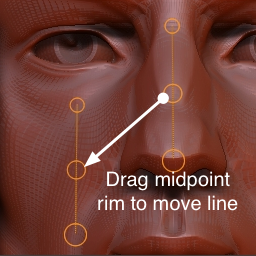 Clicking on the mesh will automatically align the action line with the surface normal for that part of the mesh. When drawing your Transpose line onto a surface while taping once the Shift key the axis icon and line will not be snapped to the vertex but will align to the screen working space. Note: You can tap or hold the Shift key to perform the Transpose alignment with the screen working plane, but keeping the Shift key pressed will add a 15° rotation constraint. Clicking on the white circle that is at the furthest point of the Transpose line will align the camera to the Transpose line. This will only rotate the camera to be aligned with the Transpose line and won’t rotate the 3D objects. The camera will be moved to the closest vertical or horizontal distance of the Transpose Line.